If your kitchen looks like it could be on the set of "The Brady Bunch," it's time to renovate. 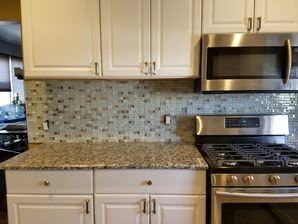 From small makeovers to complete kitchen design and remodeling, J & A Construction NJ Inc's experienced kitchen renovation team will walk you through every step of your project. J & A Construction NJ Inc has been in the home improvement business for 3 years, specializing in large and small kitchen remodeling projects. Do you need more counter space? Enhance your kitchen with a custom island for added counter space, storage for small appliances or pots and pans, and additional seating for casual get-together. A kitchen island also serves as a focal point for your room. Add unique light fixtures and a granite or natural stone countertop for maximum impact. Call (201) 371-6061 to find out how you can add work space in your kitchen with a custom island, built and installed by J & A Construction NJ Inc.
Make your kitchen work harder for you with a custom island, built and installed by J & A Construction NJ Inc.
Are you tired of your kitchen? Paint the walls or cabinets a bold color. Add architectural interest with a new window in a bold design. Refacing is a less expensive alternative to replacing your cabinets. Update your light fixtures and/or cabinet hardware. Replace your existing countertops with granite or other natural stone. Add crown molding, chair rail, or custom shelving. J & A Construction NJ Inc has 3 years of experience renovating kitchens. Update plumbing, including proper venting, to meet state code. Update electrical to meet codes. Add a ceiling fan, update light fixtures, add task lighting or under cabinet lighting. Replace your existing appliances with energy efficient appliances, in stainless steel or the new flat white. Replace your existing floor with a lower maintenance version. Replace your kitchen cabinets with cabinets that offer more functionality. Call J & A Construction NJ Inc, the kitchen remodeling experts, to find out how you can turn your kitchen into everyone's favorite room in the house: (201) 371-6061.